During my process to become paleo – one of the hardest parts for me was to find snacks other than fruit and veggies. I have done a bit of research about snack foods and nearly ALL of them have added sugars or preservatives in them. Just check a package – there are only a handful of snacks that are actually tasty while meeting the paleo requirements of being all natural and preservative free and no added sugars. So when my friend Mike decided to make some natural jerky, I was over the moon. He uses fruit juices and natural seasonings to marinate meat. The result? Awesome, preservative free jerky that is very paleo! From Jack Link’s Beef Jerky to Oh Boy! Oberto Jerky – they ALL have added sugars. Who needs that when you can have a great paleo snack in Shurky Jurky?? I have tried nearly every flavor and all of them are top notch. Not only can you get beef jerky, but also pork and turkey jerky as well! My favorite is mild pineapple as well as mesquite maple cherry with sesame seeds. Other flavors include (but not limited to) apple pork, savory pepper, and mesquite apple. Check them out today!! If you’re interested in buying – let me know and I’m happy to forward you some information. 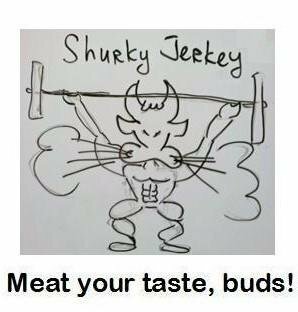 Please send me the info onhow to reach Shurky Jerky as I keep reading about them and I can’t find contact info. Great recipes! Love to find someone who thinks about food like I do! would love info on the jerky!